There is a strong relationship between weight/body condition and pregnancy rates in heifers at both their first (maiden) and second (first lactation) matings. Generally when heifers are heavier or in better condition they have higher pregnancy rates. Due to the strong relationship between pre-mating weight and pregnancy rate, it is possible to develop models that predict pregnancy rates from pre-mating weights and to set target mating weights that will ensure good pregnancy rates. These can be used to make management decisions and to do cost-benefit analyses of strategies that aim to increase re-conception rates through increasing pre-mating weights. Research conducted with commercial Brahman heifers at Victoria River Research Station (VRRS) and Douglas Daly Research Farm (DDRF) has established the relationship between pre-mating weight and pregnancy rates for several different situations (Figure 1, right). The different situations represented by the relationships in Figure 1 are when heifers are first mated at two years old and pre-mating weight is recorded in Oct/Nov, for two-year-old heifers when weight is recorded in late December, and for yearling mated heifers when weight is recorded in late December. From these relationships, tables have been produced that show the predicted pregnancy rates for Brahman heifers at different pre-mating weights. 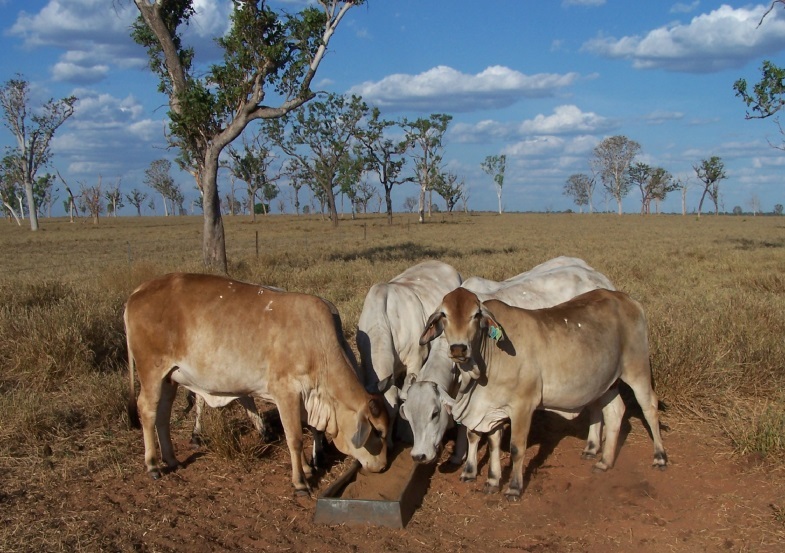 These tables are useful tools for managers of Brahman heifers in northern Australia. They can be used to identify target weights for different situations, and to predict the number of calves likely to be produced by groups of heifers, which will be useful for budgeting and assessing the profitability of different management strategies or scenarios. Gut fill: If heifers are weighed straight after mustering then they will have more gut fill than heifers that have been in the yards overnight (or for several days). On average the difference in weight after an overnight curfew (12 hours) without feed or water is usually 7% (which equates to about 20 kg in a 280 kg heifer) although individual animals vary around this average. Time of year when heifers are weighed: Often it is convenient to weigh heifers before the wet season (eg. October) for practical reasons, but many pre-mating weights quoted in research papers are actually recorded at the start of mating (usually in January). Usually rain falls between these times and heifers can grow considerably so a heifer weighed in October may be more than 30 kg heavier by the time mating actually starts in January. Age of heifers: While weight is the most important factor affecting pregnancy rates, there is an interaction with age where younger heifers usually have lower pregnancy rates at the same weight as older heifers. For example, heifers which grow faster and are mated as yearlings usually have lower pregnancy rates than heifers joined at the same weight as 2 year olds. Note - This applies more to Bos indicus heifers than Bos taurus heifers. The growth that occurs during mating: Heifers that grow more during mating are likely to have higher pregnancy rates than heifers that don’t grow as much (as they will reach heavier weights during the mating period). For example if there is a poor wet season and/or the stocking rate is too high then heifers that only grow 50 kg over a wet season will have lower pregnancy rates than heifers that had the same pre-mating weight but grew 120 kg over the wet season. So when someone says that their heifers have a pre-mating weight of 275 kg we need to know more information about that weight to properly understand what it means. For example, was it recorded after a curfew or straight after mustering? Was it recorded in October or January? Because a heifer weighing 275 kg at the start of mating in January without a curfew probably weighed about 228 kg if weighed after a curfew in October (if it grew 30 kg between Oct and Jan and lost 7% of its weight during the curfew). So understanding these things, the tables below can be used for heifer management, planning and budgeting. To use the tables find the PM Wt column that best suits your situation eg. if you weigh your heifers in October after they have been in the yards overnight then use the first column. Read down the column to find the average weight of your group of heifers and then read across to the Predicted pregnancy rate column to find the pregnancy rate predicted for that weight. When it comes to predicting pregnancy rates from weights in first lactation heifers (ie. re-conception rate after first calving) the other factor to take into account when evaluating pre-calving weights is whether the weights have been corrected for the weight of the pregnancy. Most weights quoted in research papers have been corrected for stage of pregnancy as the weight of a pregnancy (including the foetus/calf, fluid, membranes and placenta) varies greatly depending on how advanced the pregnancy is. For example, a two month pregnancy weighs two kg while a nine month pregnancy weighs 59 kg. Note that the weight of the pregnancy is lost at calving, so it is not actually part of a heifer’s body weight and does not reflect her body reserves. It is best to measure pre-calving weights a couple of months before calving so that the heifers are not stressed in late pregnancy and don’t calve while being handled. Also many producers are not familiar with correcting pre-calving weight for stage of pregnancy, therefore in addition to weights that have been corrected for stage of pregnancy Table 3 (over page) shows the predicted pregnancy rates from different weights when heifers are weighed about two months before calving (eg. in August).So Table 3 shows the pregnancy rate for weights that have either been curfewed/not curfewed and corrected/not corrected for stage of pregnancy. Where weights have not been corrected for stage of pregnancy it is assumed that heifers are weighed about two months before calving and so most heifers are around seven months pregnant at the time of weighing (when the weight of the pregnancy would be about 30 kg). Table 3. Predicted re-conception rates (by weaning) for Brahman first lactation heifers when grazing on native pasture. The pregnancy rate is shown for weights that have either been curfewed or not curfewed, and corrected for stage of pregnancy or not. Where stage of pregnancy has not been corrected for, the weights are shown for a 7.4 month pregnancy (weighing 30 kg) assuming that heifers are weighed about 2 months before calving. These tables can be used to identify target mating weights for different situations, and to predict the pregnancy rates likely from groups of heifers which will be useful in budgeting and to assess the profitability of different management strategies. Example: A manager wants to know whether a supplementary feeding program that is designed to increase the pre-calving weight of his first calf heifers by 40 kg will be profitable. To determine this he can use Table 3 to find out how much the re-conception rates will be increased by when the pre-calving weight is increased by 40 kg. If the heifers are due to start calving in October and he weighs them in August straight after mustering them and does not know how to correct for stage of pregnancy then he should use the 4th column in Table 3. If their weight is likely to be 440 kg at this time without feeding then they are likely to have a re-conception rate of about 35%. If they were 40 kg heavier, they would likely have a re-conception rate of 52%. So the feeding program is likely to give an extra 17 pregnancies per 100 heifers fed. If we value a weaner at $630 (ie. 180 kg x $3.50 per kg) then the benefit of feeding 100 heifers is $10,710. This can be compared to the cost of feeding 100 heifers to determine whether the strategy is cost effective. If heifers cannot be weighed prior to calving then it is possible to predict pregnancy rate from pre-calving body condition score (BCS).